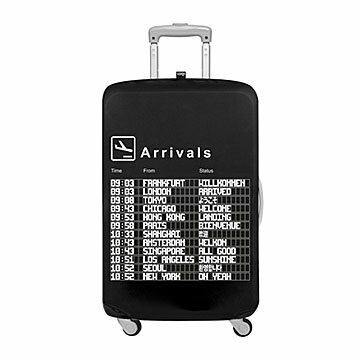 Celebrate life's journeys with this luggage cover modeled after airport status screens. Flight #9544 to Las Vegas, status: Jackpot. Flight #2608 to Hawaii, status: Honeymoon. Flight #3005 to Los Angeles, status: Sunshine. At it's most enjoyable, travel isn't about getting from A to B, but rather new adventures and magical possibilities. Celebrate life's journeys, from departure to arrival, with this charming luggage cover modeled after airport status screens. Featuring a list of popular airports around the world, each has its own clever phrase, some of which are in the country's native language (like Paris' "Bienvenue"). Made from ultra-light, flexible polyester, the one-size-fits-most fabric shields your suitcase from dents, dings, and scratches with holes for top and side handles. Made in China, which can take up to 18 hours to fly to from the US. I bought this item because I thought it would be great to protect my luggage and it's cute, but when I put the cover on my luggage it fits perfectly except for where the wheels are. It appears to have too much fabric and therefore I am not able to roll the luggage with the cover on therefore it's totally useless to me. Would not recommend.